24 « June « 2015 « Nothing in Biology Makes Sense! Ever since the (very) viral video (see below) about the honey badger (originally the subject of a National Geographic documentary), we all now know that honey badgers don’t care. They are indifferent to stinging bees and documentaries alike. But they especially don’t care about venomous snakes. Which is particularly curious given that venomous snakes kill many people and other animals. So why don’t honey badgers care? Coevolution of course! Danielle Drabeck, a University of Minnesota grad student, set out to study how honey badgers are resistant to venom. 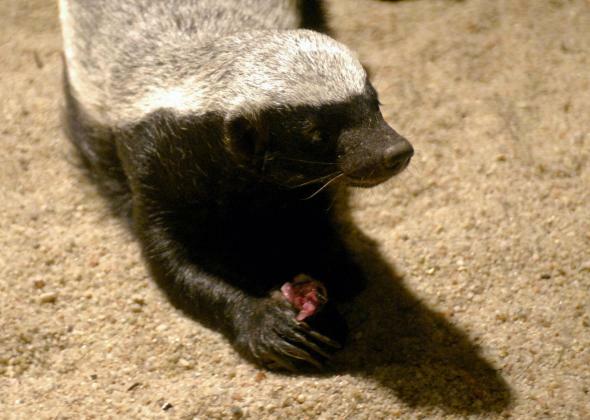 It turns out, in a mutation similar to mongoose, hedgehogs and pigs, allows the honey badgers to resist neurotoxins. Read more about it (arms race coevolution, parallel evolution, neurotoxins, HOORAY!) over at Slate.